The 14-bed inpatient rehab unit was opened last November on the second floor of the hospital to help patients regain independence after a stroke, brain injury, neurological illness, amputation or major surgery. If you need joint replacement, it’s important to look for a facility that follows best practices and offers specialized education and support before and after surgery. The Neuroscience Center at Aiken Regional offers a comprehensive range of diagnosis and treatment modalities to address your concerns, close to home. 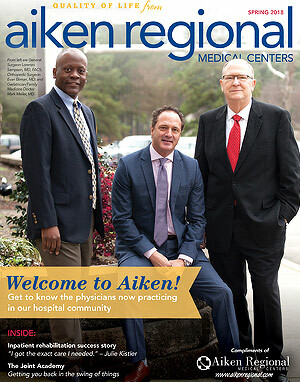 Meet three physicians who are now practicing in Aiken, whose mission is to improve the quality of their patients’ lives.